Two centuries after a golden child was born in a barn, we celebrate with a fat man (AKA politically correct “slightly overweight male”) stuffing Hot Wheels and iPod accessories into “stockings.” “Stockings” bear no resemblance to actual socks or pantyhose, and instead are just large bags decorated with evergreens, winged cherubs, and magnified snowflake atoms. And just 33 years after the previous event, we celebrate the rising of a dead man (AKA very politically incorrect zombie [I am so completely kidding with this blasphemy because my God has a sense of humor]) with baby ducks, fluffy bunnies, and sending children off in search of colored hard-boiled eggs and plastic ovals filled with anything that will rot baby teeth. When I was a child, my mom would hide Easter baskets for my siblings and me. 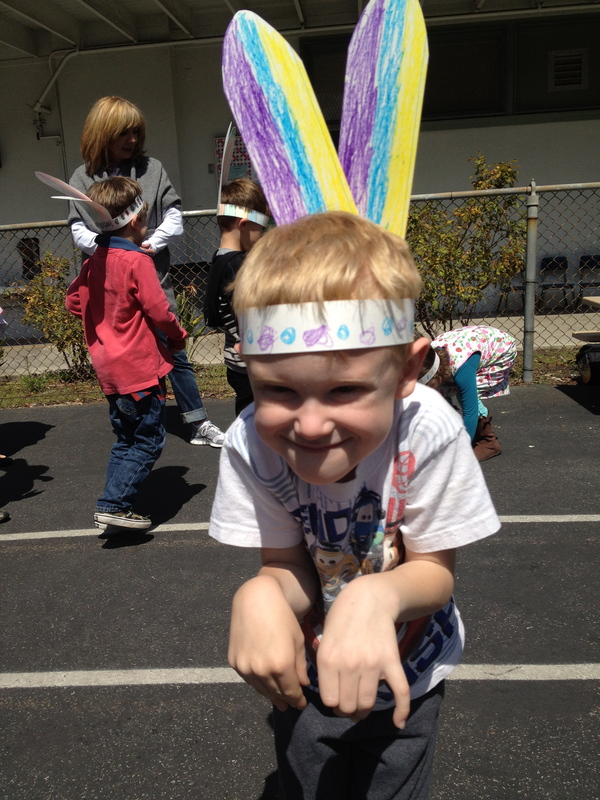 The baskets were filled with shredded plastic hay, foiled-wrapped chocolate eggs and a large chocolate rabbit. Mom was not a very good hider. The basket would be stealthily perched behind the living room drapes, on the top of a bookshelf, or underneath a dining room chair. Within seconds of getting out of bed we’d be munching the ears off defenseless brown bunnies. My oldest daughter Emily was diagnosed with type 1 diabetes when she was 3, so I never started this sugar-filled tradition with my children since they’d be getting their fill of candy later in the afternoon. I can justify that I saved them from the bitter disappointment of realizing that the large chocolate bunny was actually hollow and not filled with fudge or creamy nougat. Or I can think that because I’m a much better hider than my mom, that my kids would be spending all Easter Sunday searching for a basket that was melting in the attic, in the cupboard that stores the mousetraps, or resting on the top of our backyard telephone pole. With the exception of the whole going to mass thing, Easter was always one of my favorite holidays of the year. When I was a kid, we’d get together with the rest of the Flynn aunts, uncles and cousins at my grandparents’ home and all the cousins would have an Easter egg hunt. My Aunt Helen has a super-8 film of us dressed in our Sunday best as we all ran through the bushes searching for colored eggs. My youngest sister Teri was about 3 years old and the film shows her trying to bite through the shell of a hard-boiled egg. Today Teri’s a charge nurse in Riverside and has to pump the stomachs of children like herself who digest foreign objects that are not meant to be edible. I guess it was destiny. 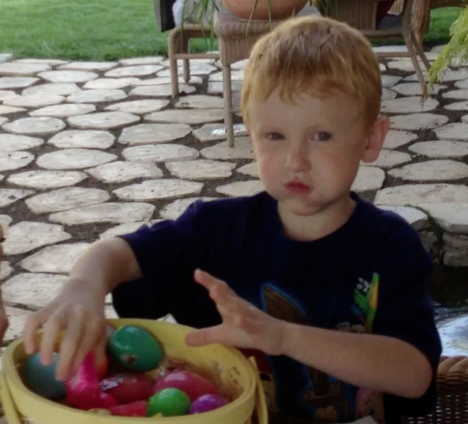 The Flynns are now spread out all over the western states, so today it’s just my immediate family that travels to my sister Tammie’s house in Fontana for the big Easter egg hunt. Besides my 3 kids, I have 6 nieces, 4 nephews, 2 great-nieces and 3 great-nephews (including one coming in July), 5 step-N&Ns and one nephew/Godson who can’t spend Easter with us anymore because he died in a tragic motorcycle accident last year (but like Jesus – the big Easter Man himself, I believe he’s with us in spirit). We make The Waltons look like a nuclear family. Every Easter Tammie hauls out a bin large enough to store a Great Dane, and it’s filled with empty plastic Easter eggs. The adults spend a chunk of the afternoon filling the eggs with candy while the kids decorate more hard-boiled eggs than they will probably ever eat in a lifetime. 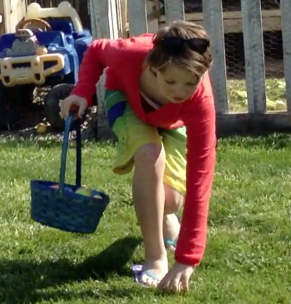 Then we hide the hundreds of eggs around my sister’s backyard, hoping that the hiding spots are not so clever that the kids will bypass them and the candy will instead be eaten by one of Tammie’s many goat-like dogs who will literally eat anything that’s not nailed down. She used to have several pet bunnies (which were appropriate for Easter), but even though they resided in a Fort Knox-like cage, they were attacked by the seemingly sweet dogs. 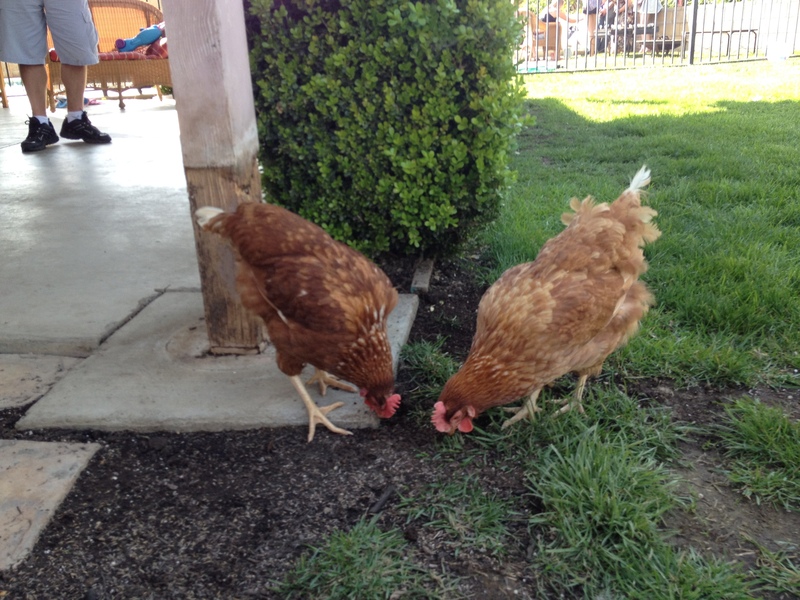 There aren’t any Easter ducks in Tammie’s backyard, but she does have two chickens roaming around, and for some reason the dogs ignore them. I assume that beaks present a more dangerous weapon than an adorable twitchy nose. 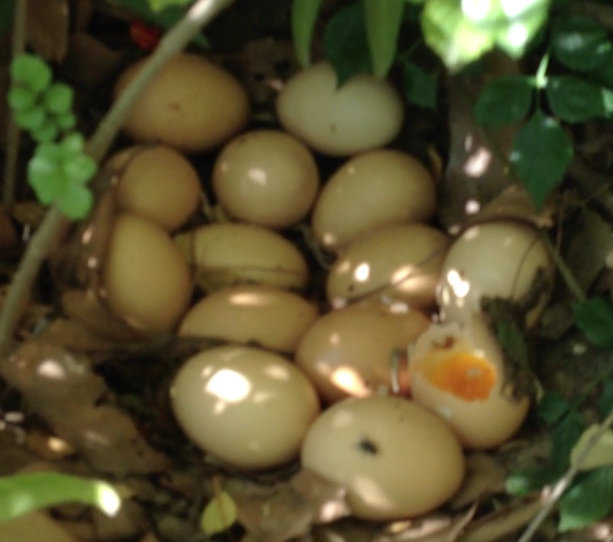 During today’s Easter egg hunt, one of the kids found a large pile of non-colored eggs in the bushes and realized that they were not the plastic variety, but instead a hidden stash laid by the chickens. It was a little late in the day to hard-boil and stain them with vinegar-scented coloring, but they’ll probably make a nice omelet tomorrow. 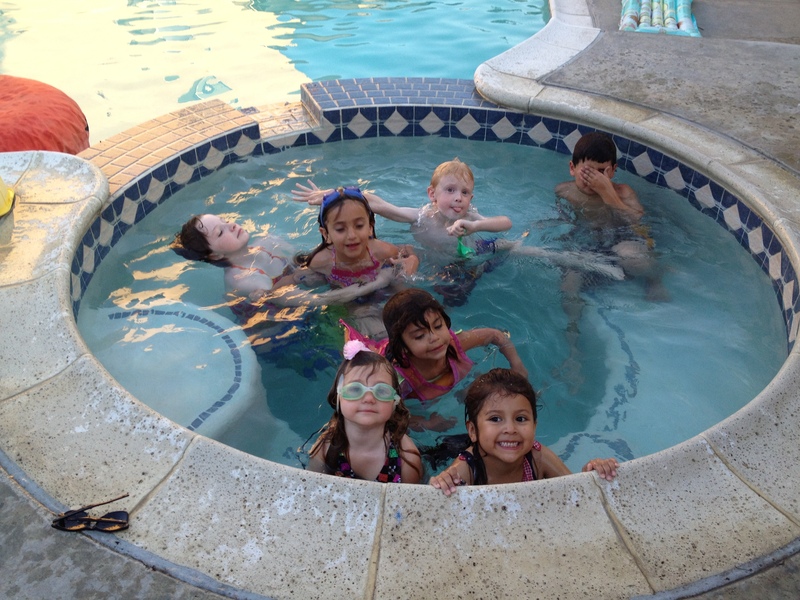 Because it was a beautiful Southern California day, the kids had been splashing in the Jacuzzi so they hunted for eggs in their bathing suits. If you’re reading this from Canada, aren’t you just a tad jealous? I am writing this blog on my laptop as my husband drives all home on the traffic-filled 10 Freeway. There are lots of other minivans and SUVs around us, filled with people like us who just spent a fun-filled day with friends and family, good food, and a fruitful search for candy-filled eggs. My kids are exhausted, which is a good thing since tomorrow ends LAUSD’s spring vacation, and full bellies and a long car ride home are sure to mean a good night’s sleep. Now on to the next big holiday: Memorial Day. It’s a day that we honor all our country’s soldiers with charcoal and hot dogs. Emmm! Charcoal and hot dogs. Easter and Halloween are very similar. Both are pagan holidays. The both involve candy. 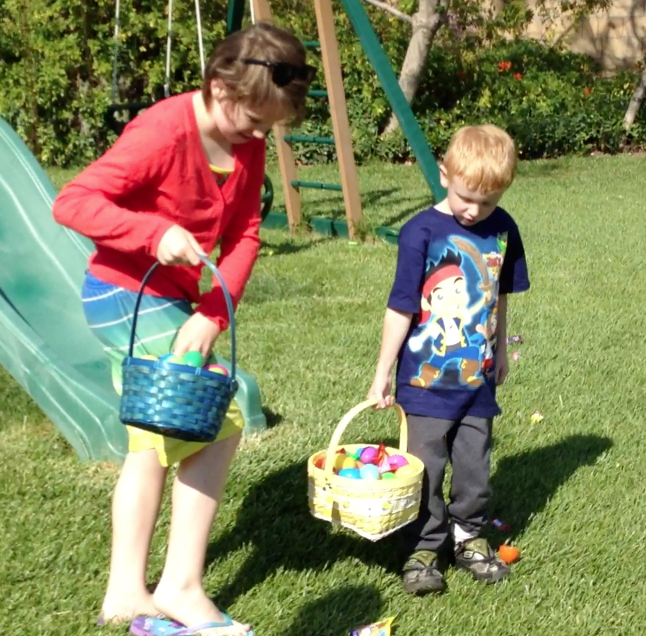 One the kids dress up to get candy, the other, the candy is dressed up in eggs for the kids to find. Neither is a national holiday that we get day off. This doesn’t make sense to me. We get two days off for Christmas to celebrate the golden boy’s birth. Whoopee do, babies are born all the time. Not great feat. But to rise from the dead, that doesn’t happen all the time. This is the event we should get a couple of days off for. Also, how in the world is the savior rising from the dead and rabbits laying eggs get connected. There is so much wrong with that concept we should take a few days off to figure that out.